All TrawlerFest attendees are invited to cast their vote for their favorite exhibitor boat on display. With over 30 trawlers of all sizes and makes (including several 2018 brand new models) there were a lot of great trawlers to choose from. So, it caught us by complete surprise when Ryan Davidson, events manager for PassageMaker, stopped by at the end of the show late Saturday afternoon to announce this coveted accolade. NaviGator’s owners, Mike and Patsy Hill, were thrilled. 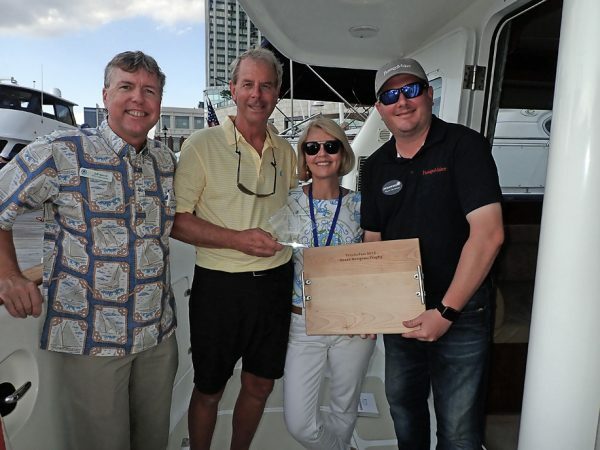 The JMYS team was ecstatic and it was a great excuse for all of us to celebrate the conclusion of another successful TrawlerFest. 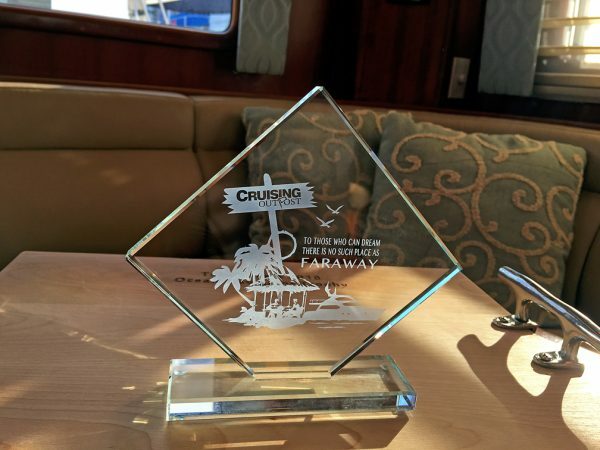 Two trophies were presented, a wood cutting block with cleats for handles from Ocean Navigator magazine and an etched glass plaque from Cruising Outpost magazine with the inscription, “To those who can dream there is no such place as FARAWAY”. To be rewarded as “best in show” is a wonderful honor for everyone involved. The Hill’s brought NaviGator down south from her summer home in Westport, CT stopping at TrawlerFest on the way home to Fort Lauderdale. The JMYS sales team was expecting a large crowd, however we did feel a bit overwhelmed at times by the sheer number of visitors. A quick look at the shoe collection on the dock emphasized NaviGator’s popularity. We welcomed all comers with no sign-in requirement, just a request to wait for a tour guide to take you through and that approach received many compliments. Christopher Bruce, Rob Piwowarczyk and Jeff Merrill took turns providing un-rushed, personal tours to everyone who stepped aboard. Sometimes there was a bit of a wait, but Alexandra Bruce and Pam Merrill were excellent greeters, and everyone in the queue was very patient and understanding. Mike and Patsy pitched in to give tours on the particularly busy Saturday with Jeff, Christopher and Alexandra presenting seminars in the classrooms. Just about every visitor left delighted – with a smile on their faces and a thank you compliment for the friendly and informative tours. NaviGator was delivered in 2005 and Mike and Patsy Hill are her original owners. Most of their travels have been along the US east coast and the Bahamas. They have her still sparkling and looking like new after 13 years of active cruising. She is an exceptional example of a premium Nordhavn 47 with the most popular options: two staterooms, two heads, flybridge, fiberglass exhaust stack and crane, and much, much more. The gorgeous summer weather and booming economy seemed to invite people from all over the country to visit Baltimore. Congratulations to Mike and Patsy Hill and NaviGator, this was well deserved. 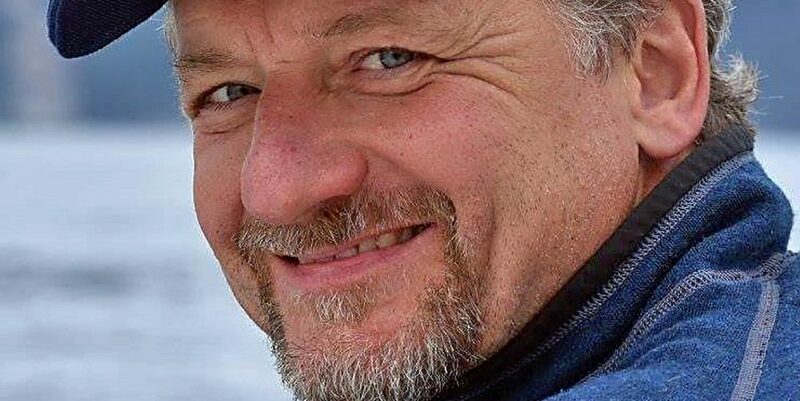 From all of us at JMYS – thank you PassageMaker magazine for another wonderful TrawlerFest, thank you to Ocean Navigator magazine and Cruising Outpost magazine for your sponsorship and finally, a huge THANK YOU to all of the trawler aficionados who came aboard and voted NaviGator as the winner of the People’s Choice Award. NaviGator is available for purchase (at least as of this writing, but the activity and excitement shown by several of the show visitors may soon change that). 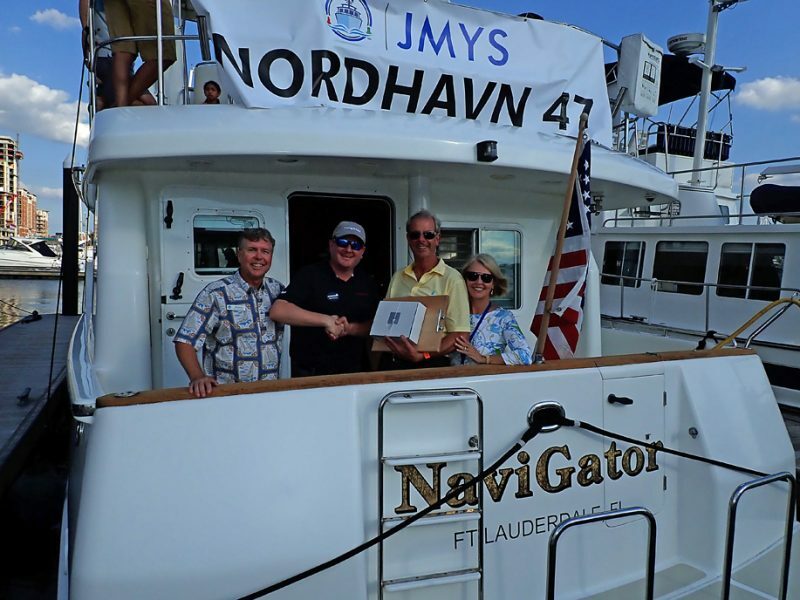 A complete description with detailed specifications, photos and video are posted on both JMYS.com and on the custom website we created to promote her, www.nordhavn47forsale.com.